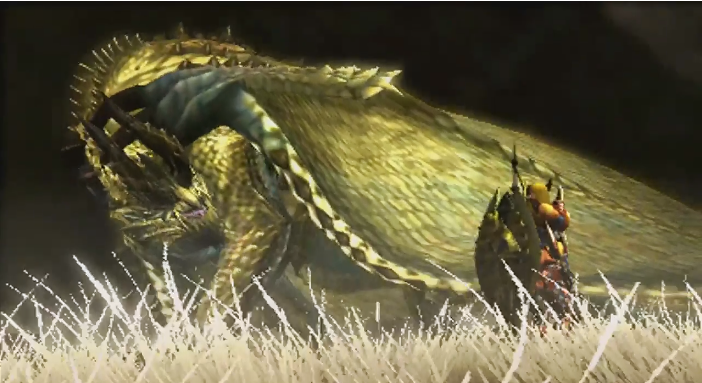 This week we meet the final offline boss in Monster Hunter 4 and the adult version of the Gore Magala, the Shagaru Magara! 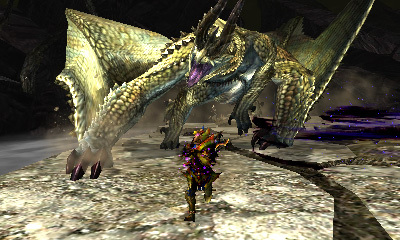 The Shagaru Magara was the final offline boss in Monster Hunter 4, but was replaced by a tougher monster in Monster Hunter 4 Ultimate. It’s classed as an Elder Dragon because of the massive damage it can do to ecosystems by infecting monsters with feral wyvern. It’s the adult form of the Gore Magala, Monster Hunter 4 Ultimate’s flagship beast. It has shed its purple skin for a golden brilliance, and its horns are now permanently protruding from its head as the Gore Magala’s did when it was in its frenzy mode. In fact, the Shagaru Magara can be considered to always be in the frenzy mode state. It has all of the attacks the Gore Magala did when it was in frenzy mode, plus a few more. And, of course, it can still get enraged on top of that. As a result, the area it’s in is always darker than normal, and it can inflict the feral wyvern status at all times; the viral substance appears to be oozing out of its body. As such, all melee attacks can infect the hunter. For more information on the feral wyvern virus and frenzy mode, check out the Gore Magala profile I wrote two weeks ago, as I outlined it all there. The Shagaru Magara can have its tail severed and carved. In addition, its horns and its wings can be broken twice each. It’s weakest to dragon and to fire, and is fought in an arena-like area known as the Forbidden Grounds. As I mentioned above, getting hit by any melee attack from the Shagaru Magara inflicts the hunter with feral wyvern. It can charge the hunter in a similar way to the Gore Magala and do a diving attack which sees it jump into the air and swoop down on to the hunter. A new attack is one in which it picks up the hunter and throws them around like a rag doll, which can be broken out of in the same way a pin attack can. Shagaru can fire purple balls like the Gore Magala, but they’re bigger and do more damage. It can also shoot a ball behind the hunter, which after a short time will explode into three smaller ones which fan outwards. 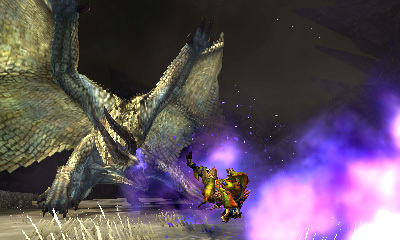 When the Shagaru Magara gets enraged, it will fly into the air and announce it with a roar; I’ve found this an excellent opportunity to charge a great sword hit, as it will land directly below the point where it leapt into the air. While it’s enraged, random explosions will light up the arena, which can inflict the feral wyvern status. Few things are more infuriating than charging an attack on an incapacitated Shagaru and watching in dismay as your feet lit up with purple. 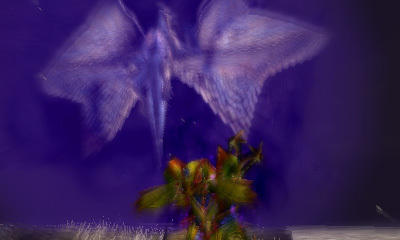 Shagaru can create exploding pillars of purple substance like the Gore Magala can. It will always do two, one after the other, and it can turn on the spot to change position for the second one. I’ve found this an excellent opportunity to land a few good hits, as it will be locked the same place for the duration of two full attacks. Because the Shagaru Magara is fought in an arena-like stage, it doesn’t run off to get food because there’s nowhere to run to. That’s about it for the Shagaru Magara. It’s a very similar fight to the Gore Magala, but with added moves and power. Tune in next week for the Dah’ren Mohran, Monster Hunter 4 Ultimate’s Jhen and the monster that’s the key to high rank! Thanks as always to the Monster Hunter Wiki for photos.